BEAVERTON — There were tears. There were some slaps on the back. That's because, as the saying goes, all good things must come to an end. 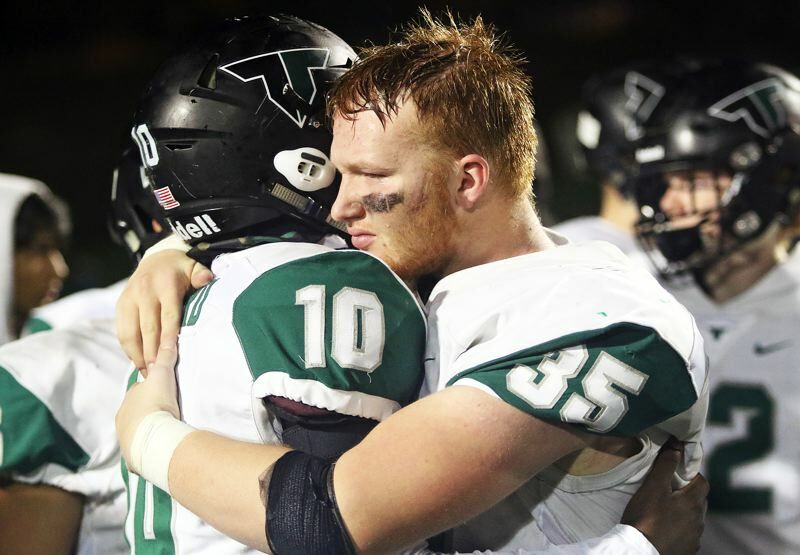 For the Tigard High School football team, the good thing that ended was the Tigers' 2018 season. 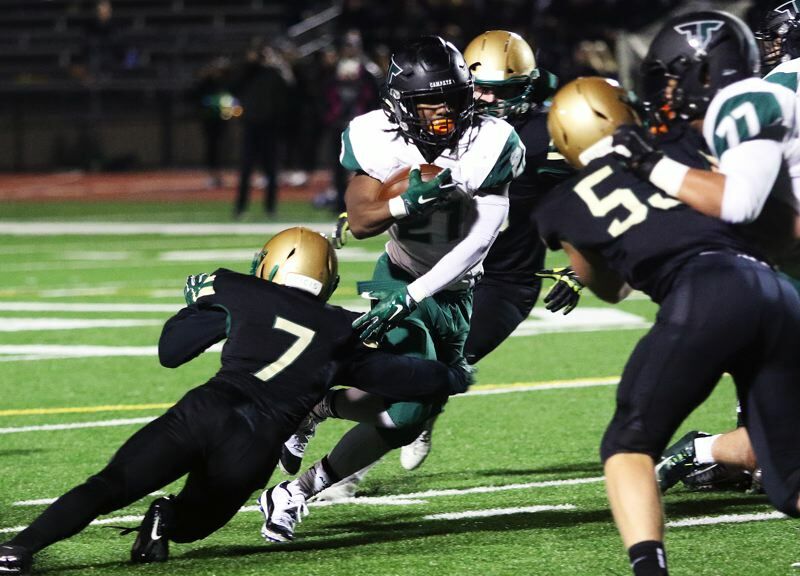 Tigard saw its season conclude with a heart-breaking, hard-fought 23-22 loss to Jesuit in a Class 6A state playoff quarterfinal game played Friday at Jesuit High School. "It was just all or nothing," Tigard senior lineman Mitchell Cross said after the contest. "They ended up pulling it out. We had our chance. It was a good game." 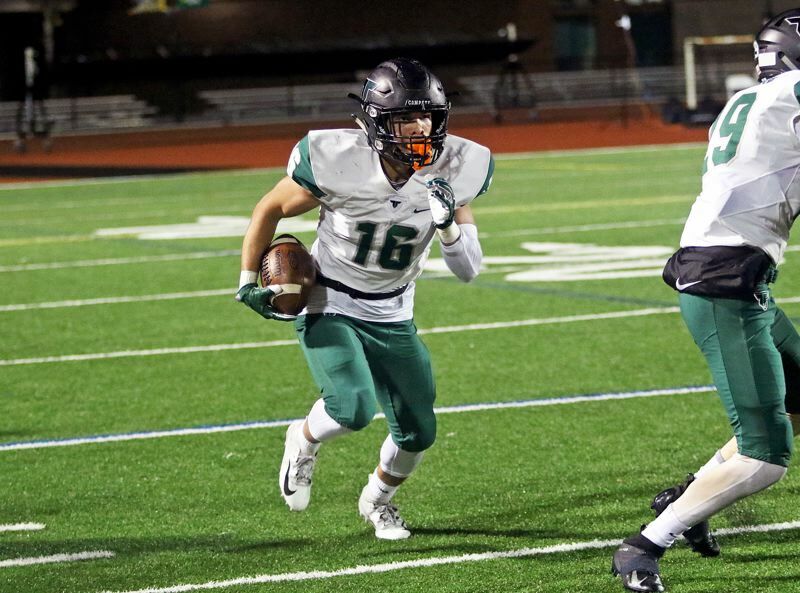 "It was great," Tigard junior receiver/defensive back Max Lenzy said of the season. "I got to play with all my friends, but we just couldn't come out on top. It's just as simple of that." With the win, Jesuit, the Metro League champion and the No. 4 team in the final OSAA power rankings, improved to 11-1 on the season. The Crusaders also advance to face Lake Oswego in a Class 6A state playoff semifinal game set to be played on Friday, starting at noon, at Hillsboro Stadium. Tigard, the No. 2 team out of the Three Rivers League, and the No. 5 team in the power rankings, finished its season with a final record of 10-2. "Overall, we had a great season," said Tigard senior Fletcher Ahl, who had both a touchdown catch and a quarterback sack in Friday's quarterfinal game. "Getting 10 wins is great. We always want to make it to the semis. It won't happen this year, but we left it all out there on the field." "We had a really fun season, we played a lot of good teams, and we just balled out and had a lot of fun playing as a team, and sticking together," Cross said. "It was all about family and sticking together." "It was a great season," Tigard sophomore quarterback Drew Carter said. "We really wanted to win this game, but we came up short. But we played Tigard Football." Yes, the Tigers certainly seemed to do that — all season long. And that season included some big-time wins, including victories over West Linn and rival Tualatin, and state playoff wins against Aloha and Barlow. The Tigard players, who went out of their way all season long to emphasize team play, turned in some impressive performances. Lenzy, who shared the Three Rivers League Defensive Player of the Year honors, finished the season with 10 interceptions. He had three interceptions in Friday's game at Jesuit, in addition to rushing for 45 yards on two carries and having a 37-yard reception. Tiger senior running back Malcolm Stockdale, who ran for 92 yards and a touchdown on 22 carries against Jesuit, finished the season with 311 carries for 2,074 yards and an amazing 36 rushing touchdowns. Carter, in his first full season as Tigard's starting quarterback, completed 108 of 193 pass attempts for 2,168 yards and 20 touchdowns, with five interceptions. 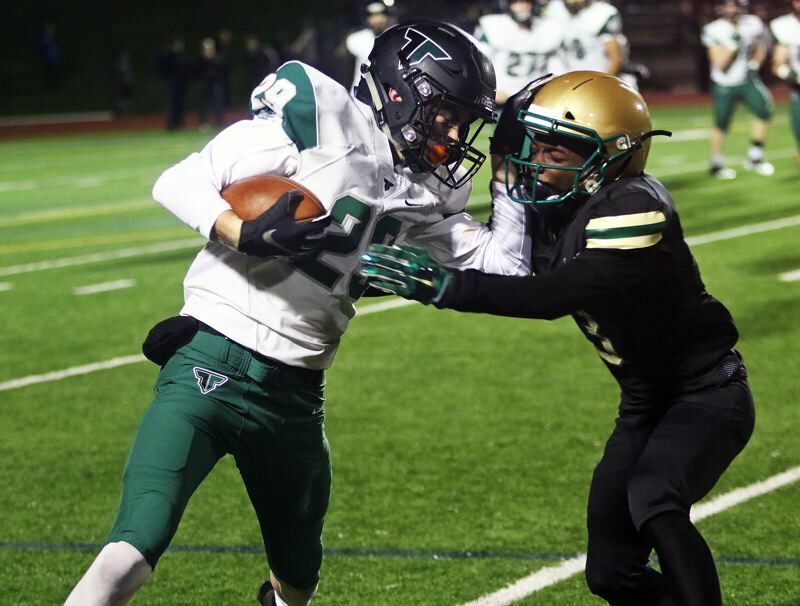 Tigard had a deep group of receivers, including senior Luke Ness (28 catches for 531 yards and five touchdowns for the season, senior Jazz Ross (26 catches for 745 yards and four TDs) and Lenzy (19 catches for 400 yards and three touchdowns). Ness had a big night in Friday's game at Jesuit, with five receptions for 90 yards. He also had an apparent 69-yard touchdown catch nullified by penalty. The Tigers, as usual, got strong play all season from their offensive line, which included senior Isaia Porter, senior Hayden McDonald, senior Mahmud Mastafa, Cross and junior Johnny Nomani, among others. Porter shared the Three Rivers League Offensive Lineman of the Year honors (he also shared Defensive Lineman of the Year accolades), while Mustafa and Nomani were both also first-team all-league picks. 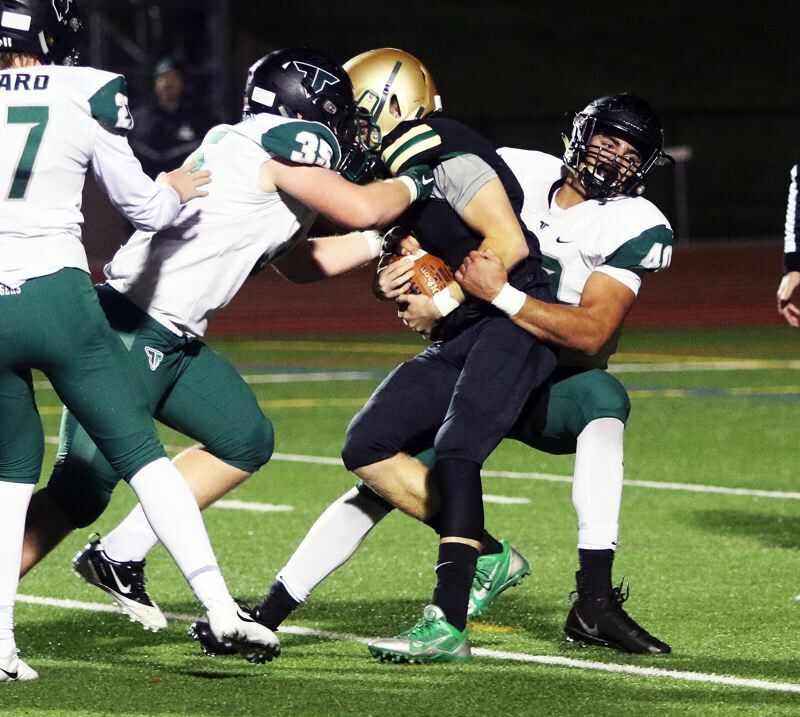 Tigard showed off its swarming, opportunistic defense during Friday's quarterfinal game at Jesuit, getting three interceptions (all by Lenzy), a fumble recovery (by Cross) and four quarterback sacks (two by senior Noah Jackman, one each by Ross and Ahl). But, maybe the most important factor to Tigard's 10-2 season was a strong senior class. "The seniors were the heart of this team," Carter said. "I love them, and we're going to miss them." "It means everything," Ahl said of the group of seniors. "Some of us have been playing together since third grade, and we've been running Coach (Craig) Ruecker's offense for all those years. He's a great coach, and we love him, and he loves us, and it will always be like that." "We're all a family," Cross said. "We all love each other and we'd do anything for each other. We just play together and hold each other as equal." And, while Tigard will likely miss its graduating seniors, it looks like it will be a talented, and motivated, Tiger squad that takes the field in 2019. "They were everything. They were a great senior class. I became close with all of them. I'm sad to see those guys leave," Lenzy said. "But we will look to get better in the offseason and use this as fuel."